1 of 1 Heat oven to 400 degrees . Heat grill or grill pan to medium heat. 1 of 1 In a medium-size bowl, stir together the cucumber slices, tomato, yogurt and salt. Set aside. 1 of 2 In a large bowl, combine ground chicken, spinach, feta cheese, oregano, bread crumbs, onion powder, salt and pepper. Stir together until blended. Shape into 4 equal-size patties. Coat patties with nonstick cooking spray. 2 of 2 Grill burgers for 12 minutes, flipping once, or until instant-read thermometer inserted into burger registers 160 degrees . Meanwhile, bake pitas at 400 degrees for 8 minutes. 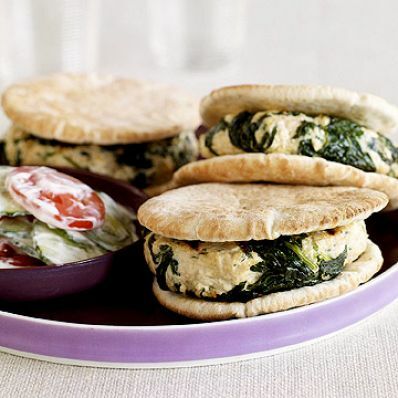 Place one burger on a pita round. Top burger with about 1/4 cup tzatziki, if desired, and a second pita. Repeat with remaining ingredients; serve extra tzatziki on the side. Per Serving: 36 g pro., 42 g carb., 472 kcal cal., 968 mg sodium, 8 g fiber, 9 g sat. fat, 20 g Fat, total, 161 mg chol.